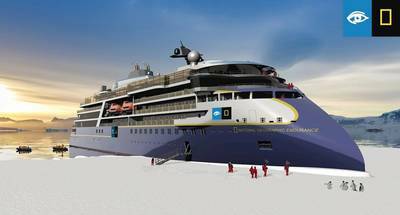 Swiss-Swedish tech giant ABB is to supply power, automation, propulsion and digital systems for the second icegoing cruise ship to be built for Lindblad Expeditions by Ulstein Verft shipyard. Destined to take exploration cruise guests sustainably and safely on voyages deep into remote polar regions, the Lindblad Expeditions Holdings, Inc. vessel will be built by the Norwegian yard Ulstein Verft to an Ulstein Design & Solutions design as a sister ship to National Geographic Endurance, whose construction is underway. As before, the latest ship will have capacity for 126 passengers in 69 luxury guest cabins. The vessel will join the Lindblad fleet in late Q3 of 2021, it said. Highlighting its preferred supplier position in the expedition cruise ship segment, ABB will deliver a full power, distribution, control and automation package for the ship, integrated in the ABB AbilityTM System 800xA, as well as twin 3.5MW electric Azipod DO propulsors. All systems will be connected 24/7 to the ABB AbilityTM Collaborative Operations Center infrastructure for remote monitoring and support of vessel systems. ABB is the only supplier of azimuthing electric podded propulsor systems of sufficiently high ice-going class able to meet the owner requirements. Azipod propulsion is a gearless steerable propulsion system where the electric drive motor is in a submerged pod outside the ship hull. Azipod propulsion has become an industry standard in the cruise segment, with the proven ability to cut fuel consumption by up to 15 percent compared to traditional shaftline propulsion systems.